The Arlington Commission for Arts and Culture and Arlington Public Art have teamed up with ACMi to produce a new ArtsArlington program. 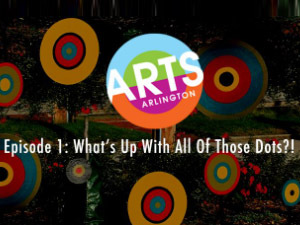 The inaugural episode, “What’s with all those dots?” was created by Arlington’s Public Art Curator Cecily Miller and ACAC Commissioner Stewart Ikeda, along with ACMi’s producer Jonathan Barbato. The program begins with a colorfully illustrated account of how the bus stop art program developed by Miller, in connection with this summer’s BRT rapid bus pilot program along Mass Avenue. It also features storefront artwork including James Weinberg’s mural on Za Restaurant. Next, an in-studio interview details a collaboration between Arlington artist/activist Johnny Lapham and business owner Abe Salhi to introduce an artistic new design to the neighborhood surrounding Salhi’s Arlington Global Service Station. Inspired by the designation of Arlington’s new cultural district, the widely praised design further inspired Arlington Public Art to work with Lapham to expand it during the bus stop project. View the first episode “What’s with all those dots?” below!